What's even harder than keeping up with internet/text acronyms? Knowing which ones are now considered obsolete, that's what. I would say, “Knowing which acronyms are 'old hat'.” But that expression would really show my age, sigh. It has been suggested some terms have gone out of favour because smart phones have the auto correct feature which makes it easier to write a complete word. 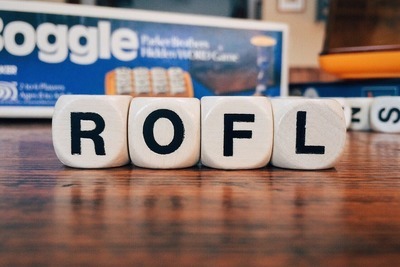 Other terms are needed less frequently as people can use internet on their smart phones. They don't need to type BRB to explain they will be leaving their keyboard because, well, they don't leave their keyboard. Other acronyms, like complete words and sayings, just pass out of favour and no one knows why, it just happens. In February this year (2017) news.com.au stated if you have used the term LOL 'within the past two years, we're afraid to say you’re a dinosaur, according to science.' Oh dear, I'm a dinosaur. 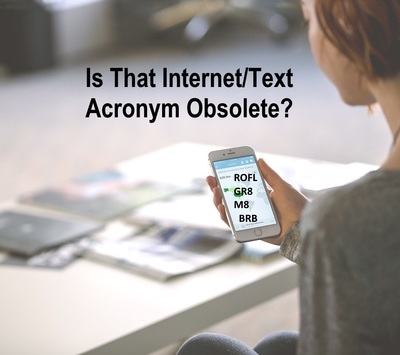 Just as other forms of language change and come into fashion and then are no longer considered 'groovy', acronyms used in SMS and internet chat communications come and go. If you think internet/text acronyms are a relatively new phenomena YMLTK (you might like to know) this isn't strictly the case. 120 years ago telegraph operators would 'chat' among themselves when they weren't busy transmitting official messages. They would use abbreviations much the same way as people make use of acronyms today.